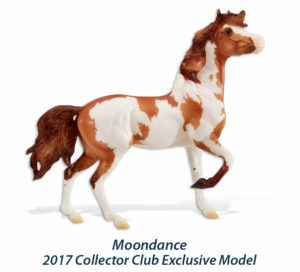 Breyer sent out an email highlighting the 2017 Collector’s Club Exclusive Special Run 7122626 Moondance. She is the Premier Club mold Forever Saige in a pretty chestnut pinto. Thus far, this is my favorite color on the Forever Saige mold! The Collector’s Club is open to anyone and costs $25 to join. You gain access to Web Special Runs and receive special discounts. I highly recommend joining the 2017 Collector’s Club! The 2016 Collector’s Club Exclusive Special Run was 712180 Abdul who is the Ashquar mold in a pretty chestnut pinto. I have 1 Abdul left for sale.